This section archives all of our old news posts. Sigma Phi Epsilon Indiana Zeta RLC is excited to welcome these outstanding men into our beloved brotherhood! Epsilon Rite of Passage will follow the Alumni Board Meeting. Brothers and Alumni only. SigEp came out on top in several different areas this semester! After a successful year, our chapter was awarded the Intramural All Sports Award and All Fraternity Award! This is an excellent example of our commitment to a sound body. Indiana Zeta also came away with the Outstanding Public Relations and President’s Award of Excellence at this year’s Greek Awards! Our chapter also won the award for Most Outstanding Chapter Programming among all fraternities on campus! A special thanks to Brother Adam Jerry for his hard work as the VP of Programming. SigEp at Valpo has been known for its excellence in educational, social, campus, and community programming and we are proud to continue this tradition. The chapters stunning 1st Place performance at Songfest was a great way to round out the semester. Sigma Phi Epsilon IN Zeta is proud to announce that our chapter took best male performance, most creative performance and most in crowd pleasing in the 2012 Songfest competition. The theme this year was the future of fraternities, and the crowd loved the performance. A special thanks is given to brother Dane Callstrom for coordinating and to all the brothers who participated in the event. The video can be viewed below and in our videos tab. We would also like to congratulate the women of Kappa Delta for taking first place in the women’s category. This year brothers Charlie Walesa, Zach Huey, Eric Goetsch, Adam Reister and Cody Newport paired with the Valparaiso University Police Depart to take part in the Polar Plunge to raise money for the Special Olympics. Sigma Phi Epsilon would like to congratulate Brother Ben Macy on officially becoming the 2012-2013 Student Body President of Valparaiso University! 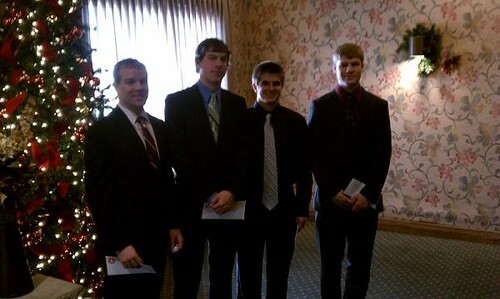 From February 25 – 26, the Executive Board of Sigma Phi Epsilon Indiana Zeta attended Carlson Leadership Academy (CLA). The experience was enriching and engaging as it highlighted achievements from chapters across the Midwest and challenged over 700 SigEp leaders to improve their individual chapters. The Indiana Zeta chapter was recognized with the SigEp National Manpower Excellence Award and The Scholarship Award for maintaining the highest GPA on campus. You can also pay your dues online. Click the link on the alumni page. In Zeta is proud to share the introduction to our chapter shared by nationals at Conclave 2011! IN Zeta is proud to share exciting news as a result of our continued excellence on campus! Once again, SigEp earned the highest GPA among all fraternities on campus. Our combined spring 2011 GPA of 3.23 was large improvement upon our previous success and further demonstrates our dedication to building balanced men. This also represents a large increase over the all-campus men’s GPA, showing that SigEp offers students a college experience that leads to greater success than other students on campus. Additionally, student representatives from Valpo just returned from Conclave, SigEp’s national convention for undergraduate chapters. IN Zeta won a Buchanan Cup for the chapter’s outstanding work over the past 2 years. The Buchanan Outstanding Chapter Award, named in honor of two-time Grand President and Grand Treasurer Edwin Buchanan, is indicative of the highest level of undergraduate achievement in our Fraternity. The “Buc Cup” recognizes the best-of-the-best Sigma Phi Epsilon chapters. Chapters are measured against the accomplishments of their peers at campuses across the country. Only the chapters that excel in every area of operations and further the Grand Chapter’s strategic plan qualify for this high honor. IN Zeta is proud to be one of only 37 chapters from across the country to have received this honor! 6 members of IN Zeta will be representing Valpo at Conclave, SigEp’s national conference, this weekend. Chapters from across the country meet to develop leadership skills and celebrate the accomplishments of our fraternity. We will be sending twitter updates from Phoenix, so for more information on Conclave, follow @ValpoSigEp on twitter or see the updates above on this page. Sigma Phi Epsilon IN Zeta is proud to announce that our chapter took best male performance in the 2011 Songfest competition. The theme this year was love, and the crowd loved the performance. A special thanks is given to Dane Callstrom for coordinating and to all the brothers who participated in the event. The video can be viewed on the main page, and also in the video section of the website. We would also like to congratulate the women of Kappa Delta for taking first place in the women’s category. Sigma Phi Epsilon congratulates brother Dane Callstrom for winning the title of “Mr. Greek 2011”! Dane stole the show with his stunning looks, outstanding musical talents, and quick thinking. Great job, Dane! From February 25 – 26, the Executive Board of Sigma Phi Epsilon Indiana Zeta attended Carlson Leadership Academy (CLA). The experience was enriching and engaging as it highlighted achievements from chapters across the midwest and challenged over 700 SigEp leaders to improve their individual chapters. This year, Indiana Zeta won two awards! The Scholarship Award for maintaining the highest GPA on campus, and The Manpower Award for excellence in membership and recruitment at Valparaiso University. CLA also taught the Executive Board to progress individually and collectively. Each officer had sessions where he could interact with alumni and fellow officers from different chapters to learn and improve his leadership skills within the organization. The Executive Board has worked diligently to develop new goals and aspirations for the continuing excellence of our fraternity. CLA is just one part of the SigEp The Leadership Continuum. This program is an award-winning series of distinct and progressive leadership opportunities aimed at teaching and reinforcing SigEp values to a Brother from the day he joins until the day he graduates. Through self-discovery, analysis, and interaction, Brothers develop skills necessary to lead balanced lives and to continue leading the fraternity world. This type of program is truly one-of-a-kind and is the only comprehensive leadership experience offered to men participating in Valparaiso University greek life. The SigEp Leadership Continuum has given our Brothers the skills needed to be the leading chapter on Valpo’s campus by shedding the traditional “pledging” model in favor of a focus on leadership development and continuing education. Sigma Phi Epsilon Indiana Zeta is excited to welcome these outstanding men into the brotherhood! We would like to thank everyone who participated in the Balanced Man Scholarship this year. It was undoubtedly one of the most difficult years because of the large number of exemplary candidates. After much contemplation, we narrowed the search down to around 15 men. We would like to congratulate Zach Schlecht as our first place winner, as well as our runners-up Derek Wessels, Evan Byers, and Matt West. Sigma Phi Epsilon is proud to announce that we have once again achieved first place in grades out of all of Valparaiso University’s men’s fraternities! This is the fourth semester in a row we have held this title, bringing us to leading in grades six out of seven of the last semesters. Sigma Phi Epsilon would like to invite all men considering joining Greek life to attend our rush events for Spring 2011. Come down and have a great time while getting to know our brothers! â€¢Meet at the Harre Union at 2pm, and tour all of Valpoâ€™s fraternities. â€¢Snow football on the Law School field. Chili and NFL playoffs on the big screen after! â€¢Come to the house for video, board and card games. â€¢Classic 2 on 2 floor hockey tournament at the SigEp house! Free pizza, chips, & pop! â€¢Meet at 2:30 by the Union Welcome Desk, then weâ€™ll drive to catch the 4pm game! â€¢Single elimination tournaments at the house. Free food for all, prize for the champion! â€¢At the SigEp house. Youâ€™ve never played dodgeball like this. â€¢Come to the SigEp house to try your hand at curling, bobsledding and snow rugby! â€¢Meet outside of Lankenau Hall at 9:30 for an afternoon of paintball! SigEp would like to thank all of those who made SigEp Christmas 2010 a success. We managed to donate over $1000 in addition to toys and games. We are sincerely thankful for all of your contributions. Check out what our seniors will be doing after graduation! This addition to our website can be viewed here or by selecting the link under the Brothers section on the sidebar. Good luck seniors! Sigma Phi Epsilon would like to congratulate Brother Brad Lubeck on officially becoming the Student Body Vice President of Valparaiso University! SigEp took second place in this year’s Songfest competition. Congratulations to Kappa Delta and Phi Kappa Psi on their victories this year. The video of SigEp’s performance can be viewed below. Sigma Phi Epsilon President Jacob Tewes sang the solo during "You’ve Lost that Loving Feeling." The band was also all SigEps featuring Jon Becker on drums, Dane Callstrom on keyboard, Grant Chapman on bass, and Kris Parrent on guitar. The theme for our performance was "Top Gun." The performance was directed and choreographed by Dane Callstrom. Enjoy the video! Congratulations to Tommy Lindell ’11 for being accepted into the upcoming Ruck Leadership Institute. Joining the ranks of Adam Dralle ’10, Geoff Yates, and Nate LaGrange ’08, Tommy continues to represent IN Zeta at this highly selective program. Ruck scholars are some of the best undergraduates SigEp has to offer. They are taken to the College of William & Mary, the birthplace of the American College fraternity, to participate an intense five-day leadership experience. Sigma Phi Epsilon Indiana Zeta is now composed of 26 seniors, 24 juniors, 8 sophomores, and 15 freshman. Welcome to the brotherhood! The following is the Fall 2010 spring recruitment schedule. We do, however, practice year-round recruitment. If you miss out on the semester events and are still interested in joining, please contact the VP of recruitment. Although Valparaiso University does not permit freshmen to join greek life until the spring semester, they are welcome to attend our fall recruitment events. Sunday, September 5th: Buffalo Wild Wings @ 4:30 p.m.
Join us and a panel of our seniors for wings from Buffalo Wild Wings down at the house! Come with any questions and get a new perspective on SigEp and Greek Life. Come down to the house for some Halo and Call of Duty! Free food & drinks! Classic 2 on 2 floor hockey tournament at the SigEp house! Pizza, chips, and soda will be provided..
Come watch the Bears or Colts play and enjoy free food and drinks at 1:00, then be ready to head out to the field to play at 4:00! Every year, Indiana Zeta awards scholarships to incoming freshman males who have shown dedication to developing a sound mind and body in their high school careers. More information can be found on our Balanced Man Scholarship page. The scholarship is absolutely free to apply for, and we would encourage all incoming freshman males to submit an application! The 2009 Balanced Man Scholarship application can be downloaded here. You can turn in the application at the Union front desk or give it to any SigEp brother. You can also view the accompanying letter. Several members of our chapter took the opportunity to go down to Indianapolis over the weekend to participate in some philanthropy with Extreme Makeover: Home Edition. TV station, Indiana 6, did a profile on some of the local companies participating in the event, and this video featured Jake Hautly and Colin Fields, with extensive photos of Jake in his letters. Check it out embedded below, or head over to the Indiana 6 website, here. Feel free to head over to the discussion board to discuss this video here. On Friday, January 30, spring rush ended, and ten men turned in their bids to join the Indiana Zeta chapter of Sigma Phi Epsilon. The quality of these ten men can not be overstated, and the chapter as a whole is very proud to call them members of this Fraternity. They began the Balanced Man program that night by going through the Sigma right of passage. In addition to getting new members, the Fraternity leadership also transitioned on Sunday, February 1, as the new executive board was sworn into office. The new officers can be viewed here. Discussion of this article can be found on the forums, here. Dustin posted some sweet pictures of Plug’s Pond, an ice rink in the house’s parking lot. Undergraduate men who are interested in learning more about the brotherhood of Sigma Phi Epsilon are invited to join the brothers at the following events. For more information regarding recruitment click here. The next wave of Sig Ep leadership has been decided in what was a very lengthy election process that lasted several weeks. After much debate, it was Adam Dralle who was elected the next president of the Indiana Zeta chapter. His executive board will be Jeremy Redenius as VP of Programming, Steve Odegard as VP of Recruitment, Collin Fields as VP of Brotherhood Developmant, Jon Becker as VP of Communication, Adam Westrick as VP of RLC and the Chaplin will be Stefan Schalk. John Grotheer was most recently named VP of Finance by the Alumni Board. The new executive board will take their positions on February 1, of the the next year. Just as millions of children around the globe are anxiously awaiting the coming of Santa, members of the Indiana Zeta chapter are anxiously awaiting their largest philanthropy event of the year. Sig Ep Christmas will kick off on Saturday, December 6 from noon till 3:00 pm in the Christopher Center’s Community Room. The second annual event is designed to raise toys for the Reiner Community Center. The event will feature the opprotunity to sit and take photos with Santa Claus. Of course, families are encouraged to attand and to enjoy the festivities. Beyond the company of Santa, live music will be played and traditional Christmas treats will be served. However, the most important feature of the event will be the toy drive and donations taken for needy families hurt most by the tough economic times. With economic troubles peeking this holiday season, millions of families may have a harder time filling their children’s stockings. To brighten up the holidays for these families by making a donation, contact Alex Voerman at (414) 573-3566. Indiana Zeta alumni and actives are looking forward to this years Homecoming on October 11. The INZETA celebration coincides with Valparaiso Universities momentous sesquicentennial anniversary. Active brothers have spent a lot of time already preparing the house for this years Homecoming, which already promises to be one to remember. Brothers are invited and encouraged to stay at the house between events and enjoy each others company. Three SigEps from IN Zeta spent the beginning of their summers in a remote village in Kenya. Eddy Brouch, Jeff Macke, and James Nagel travelled with the student organization Engineers Without Borders to Nakor, a village located in the northern region of Kenya. Nakor is located in a desert and the people who live there usually eat one meal a day. The group included 14 Valparaiso University students, an engineering professor, and another professor’s husband. The purpose of the trip was to install solar panels and a merry -go -round that pumps water, both of which provide water for gardens where vegetables and other food will be grown. Wells had been dug by previous groups for drinking water, and the greatest need was a continual source of water that could help sustain garden plots. The group successfully installed the solar panels, fixed existing windmills, and assembled and constructed the play pump. The experience also provided insights into a culture very far removed from life in Valparaiso, Indiana. The group learned phrases and songs in Turkana, the spoken language in Nakor, each day during cultural lessons. “It was an eye opening experience to see how these people live. It might be cliché, but we are really lucky here in the states and we have way more than these people could even imagine,” commented Jeff Macke. Click here for a YouTube video of the play pump in action. Building on a tradition, SigEp has won Valparaiso University’s All-Campus Intramural title for the second year in a row. We’ve now held the intramural title for 7 out of the last 8 years. This has been a good year for us. With only a couple more days of finals and a week until graduation, we’re all looking forward to a break from the action. On another note, the Spring 2008 Sigma project is almost done, and the back patio is looking great. We’ve been power-washing the deck and the fence, and the staining/sealing is almost complete. Plans for some gardening around the deck and fence are in the works, and it should look awesome for homecoming next year. There were a plethora of awards handed out to the men of Sigma Phi Epsilon at VU’s 2008 Greek Awards. In total, Sig Eps took seven of twelve potential awards handed out that Monday night. The Indiana Zeta chapter as a whole received four awards; Fall grades, Spring grades, Outstanding Chapter Programming and the esteemed President’s Award of Excellence, which is given to the overall highest achieving fraternity. Sig Ep also took a majority of the individual awards. Robby Pampel received the highly regarded Greek Man of the Year Award. Matt Riley and James Crowley were also individually lauded, with Matt receiving the Safe Man of the Year Award and Crowley taking the Dr. Alan Harre Civic Engagement Award. To see other awards that Indiana Zeta and individual Sig Eps have won in past years, visit the awards page. Indiana Zeta did it country this year. We had a lot of fun putting together our show for this year and ended up taking second place in the Men’s Division while winning the Overall Most Creative Award. As soon as the video is edited, we’ll post a link here. Heart to heart to all the dudes who helped put it together this year, especially Tyler Schofield, Robby Pampel and Geoff Yates. Thanks to the guys who helped in the band too: James Nagel, Alex Marque and John Williamson. I added a BBCode reference page. The alumni page has been updated with a little more information about our alumni accounts process. If you are an alumni of our chapter, you can click this link and signup. Your account will then be in limbo while we confirm that you are actually an Indiana Zeta alumnus. Our Alumni chair will verify your standing and confirm your account, and you will receive an email notifying you that your account has been confirmed. One of the benefits of having an alumni account is that you will have access to the private sections of the site. We have just added a private message forum for actives and alumni to interact. You can also comment on news, send private messages to all actives and alumni, and you can have access to contact information for all actives and alumni. We plugged the website quite a bit in our most recent newsletter, and we’ve been getting a steady stream of SigEps signing up since then. Thanks to all of our alumni who are signing up, and we look forward to hearing from more. The chapter would like to announce and give congratulations to Sophomore Geoff Yates. He has been selected as one of the lucky undergraduate members of Sigma Phi Epsilon who get to attend Ruck Leadership Institute. Ruck is basically SigEp’s Top Gun. The national fraternity selects some of the nation’s top members and sends them to the College of William and Mary, the birthplace of the American College Fraternity, to develop their personal leadership and mentoring skills. Geoff is a sophomore Mechanical Engineering student. He works as an Ambassador in Admissions for Valparaiso’s Admissions Office, is a member of Valparaiso’s Ultimate Frisbee team and drives a 1970 Chevelle. A big heart to heart goes out to Dustin Lawrence and Brian Keller for taking charge and putting together the newsletter. Alumni and all of the actives’ parents should have received a copy of it in the mail already, but if you haven’t, get in contact with Dustin Lawrence. A dedicated page to the Balanced Man Scholarship has been added to the website. This page will archive the winners of our scholarships and provide information for freshmen interested in applying for our scholarship. This is a little late, but we want to let everyone know about our accomplishment. Last semester (Fall ‘07), we set a new house record for grades. Our chapter’s average GPA for last semester was over a 3.4. This is a new house record and should definitely put us among the top SigEp chapters in the nation for grades. We’re extremely proud of this accomplishment and hope to continue this trend of being the top fraternity on Valpo’s campus with respect to grades. The 2008 recruitment schedule has been finalized. It has been posted on the recruitment webpage. Check it out. We’d like to thank everyone who came out to our first SigEp Christmas event. The event was well attended, and, more importantly, we collected a lot of money and presents for the kids over at HillTop. The cookies and hot chocolate were a great hit, and lots of students came by to get their picture taken with Santa. Buckman Page was also in attendance and put on an excellent set. Thanks again to everyone who came out… look forward to an even bigger event next year. Oh, and here’s a photo album of the event. SigEp Christmas is a philanthropy event that our chapter is putting on this year. We are accepting donations of money and toys so that we can give them away to kids at the HillTop House. News here can only be seen by brothers. Feel free to comment, make suggestions, etc. We just heard that we at Indiana Zeta have won another Buchanan Cup for chapter excellence! This award is given to the best SigEp chapters in the nation every two years at our national gathering. This is Indiana Zeta’s fourth Buchanan Cup in a row, and we’re looking to continue the streak. …oh yeah, we also repeated last year’s win of Songfest with the Overall Most Crowd-Pleasing award and 1st Place, Mens’ Division. There is a lot of news to write about since no news posts have been added since March! We are proud to announce that we have regained our Intramural Championship crown. SigEp has now won Valparaiso University’s all-around Intramural title 6 out of the last 7 years. In addition to that award that was handed out at Valpo’s annual Greek Awards, we also received the President’s Award of Excellence, Greek Man of the Year (Sean Jesse), First Place Overall in Academics, and Outstanding Chapter Programming. The awards page has been updated to reflect this. Valparaiso’s Ultimate Frisbee team also held a (to be) annual 5-on-5 tournament in which Sigma Phi Epsilon entered two teams. We ended up taking home both the first and second place trophies for the event. We’re looking forward to a relaxing summer before we get ready to hit the ground running again for another great year. SigEp wins IM water basketball! Before Spring Break, Sigma Phi Epsilon finished an undefeated season by winning the intramural water basketball tournament. Fielding a team of all-around athletes and current/former Valpo swimmers, SigEp was able to hold off the other team for a convincing win. Many brothers were in attendance, and, after the game was over, most of them could not contain their excitement and had to start celebrating immediately. Click on the link for a video posted on YouTube. This last weekend, our new executive board and a few other brothers attended SigEp’s Carlson Leadership Academy. CLA is a leadership development program mainly meant to help our chapter executives work effectively. In addition to these chapter awards, last term’s president, Sean Jesse was selected to receive our region’s J. Edward Zollinger Outstanding Senior Award. This award is given annually to an outstanding senior in each district of SigEp based on scholastic achievement, fraternity and campus leadership, and community involvement. Proud as hell of our accomplishments from last year and Sean Jesse’s contributions to our chapter and the community. We are excited to welcome 17 new brothers into our fraternity: Jon Becker, Josh Cardinal, Marcus Chaffee, Adam Dralle, Tim Garibay, John Grotheer, Brett Hartmann, Ray Hylton, Alan Kus, Phil LaBrash, Max Liedl, Joel Mathwig, Aaron Moy, James Nagel, Marco Porcelli, Stefan Schalk, and Geoff Yates. After a very intense and fun two-week rush period consisting of events like paintball and floor hockey, we are absolutely thrilled to welcome these new men into our brotherhood. They are getting started on the Sigma Program with their coordinators Scott Dueball, Scott Fremont, and Kyle Verage. Damn proud. Two new photo galleries have been added to the Photo Gallery section of the website. One is a selection of pictures from one of our ultimate frisbee games this past semester, and the other is a gallery of our annual Christmas Cookie party where we invite sororities to come down and enjoy our home-made Christmas Cookies and hot chocolate. Attention Freshmen. Please head over to the recruitment page and check out all of the recruitment events we have planned for this semester. Highlighted events include a free trip to Chicago to see the Wolves play, free Paintball with the SigEps, and our intense floor hockey night. The website has been updated with a new Photo Gallery section. This is one addition in the media department which is still being developed. Expect more media such as videos and music to be posted soon. The first set of photos in the Photo Gallery are all from the 50th Anniversary celebration from Sept 29-Oct 1. Photos by Brian Keller. Today the SigEp team 1 ultimate frisbee team took the intramural championship match against Phi Kappa Psi. SigEp was undefeated throughout the season, and now our ultimate frisbee team helps us maintain our number one spot in the overall intramural points standings. Click for a picture of the team. We would like to thank all of the freshmen who applied for our Balanced Man Scholarship and especially congratulate our finalists and winners. It was a tough field of truly balanced men. Click here for a picture of the winners. The winner of our $1000 academic scholarship was Paul Wolf (pictured left), and our three other $500 scholarship winners were (pictured from left to right) Stefan Schalk, Rian Aaron McMaster, and Max Liedl. After a very busy two-week rush period, we are happy to announce the addition of 5 new brothers to our house: Mike Calvillo, Chris Hippler, Dustin Lawrence, Ian Tiggeman, and Yuuki Guzman. They are jumping right into the Sigma program and we are really excited to have them. Just in time for fall recruitment, we are launching the new and improved chapter website. New features such as pictures and videos are coming soon. Please contact Jay Strybis if you find any errors in the website.